di Women in Business 12 Dicembre 2017 8 min. 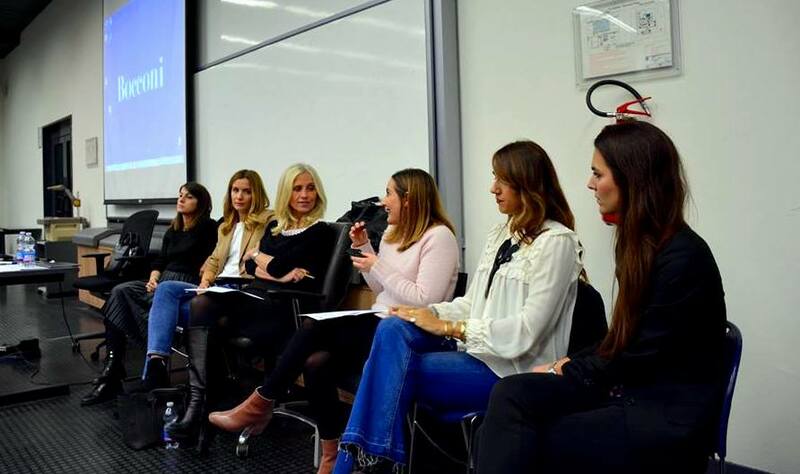 On the 29th of November, the Women in Business Association hosted a public event in Bocconi to discuss The Female Influence in the Digital Age. Successful bloggers and social media managers of top companies were invited as guest speakers to share their experiences as a woman in the digital era. The panel of speakers included: Lucia Zuliani who blogs as lazitellaacida on her blog “Ma Ti Sei Vista?”, Caterina Zanzi who shares her insider knowledge about the Milanese kitchens on “Cononsco un posto”, Giulia Torelli who blogs for the fashion magazine Grazia on her blog “rock’n’fiocc”, Eliana Salvi who connects and helps female travelers all over the world with her platform PinkTrotters and, last but not least, the managing director of Pulse Advertising, Stefania Casciari who connects bloggers with brands. The event was moderated by Professor Profeta from the Department of Policy Analysis and Public Management, Bocconi. The digital revolution brings new opportunities for female empowerment. The digitalization has accelerated the battle on gender inequality by giving women a voice who were not heard before and empowering them to share their views and opinions. Women now have the power to draw attention to issues that were not talked about in the past. The #MeToo movement is a great example of that. In order to make the world a place where men and women are treated equally, more taboo topics need to be discussed. Women should raise their voices about issues that men in the past have ignored. The digital world offers great opportunities for women to do exactly that. However, a greater presence on the internet also comes with risks. Pictures and information can be shared without the consent of the person who is portrayed. Many internet users are very outspoken under the cover of anonymity and often forget, or don’t care, that they are talking to or about a real person. Everything that is put on the internet stays on the internet and even with the strictest privacy settings, our information is still not completely private. Every word online is public. Just like in the real world, women are more present in some industries than in others. Overrepresented in fashion, underrepresented in finance. Also, followers appear to be very segregated. For example, Caterina, who blogs mostly about food which is not really an exclusively gender specific topic, is mostly followed by women. Stefania thinks that even with this segregation, women can use their power in their specific field and bring up other topics. Many bloggers or Instagram users have a huge influence on their followers. For our guests, however, the number of followers is not the main indicator of influence. Micro-influencers, who might not have the highest follower count but instead more relevant and interesting opinions, have a greater impact on them. For Stefania and Lucia one of those influencers is Sheryl Sandberg, the COO of Facebook who shares her advice on becoming a successful female leader in her book Lean In: Women, Work and the Will to Lead. Eliana for example, is following Arianna Huffington, author, journalist and co-founder of The Huffington Post, who is sharing many inspiring articles on her LinkedIn account. The bottom line is that everybody is influenced by different people and that it doesn’t have to be the blogger with the most followers but with the most relevant opinion to you. Our guests have all started their blogs with an idea and the wish to share their opinion. Eliana’s advice for anyone who is thinking about starting a blog is that if you have something to say, share it and then see if people are interested in what you have to say. Caterina adds that in her experience followers appreciate when people are honest and also share their bad days. Giulia on the other hand had very different experiences with sharing her personal opinion. So, she advises to better tune down the personal opinion. I guess we will never know what is best unless we try it out ourselves!